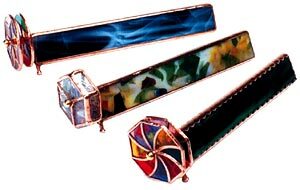 Contains all the patterns, instructions and hardware necessary to make a kaleidoscope from stained glass. This unique design has a 10" tapered viewing tube and two rotating hexagonal color wheels. This unique kaleidoscope in the shape of a classic biplane is a guaranteed conversation piece. Kit includes wood wheels, hardware, precut front surface mirrors and patterns. 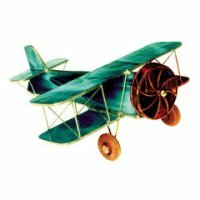 Just add your choice of glass to make this fun biplane with 9" wingspan. This kit creates a traditional stained glass kaleidoscope in a compact size. Included are three precut pieces of aluminized front surface mirror, complete brass axle assembly, mounting eyelets, 12 full size patterns for color wheels and complete instructions. Stand sold separately. The axle pack can be used to mount stained glass wheels onto your kaleidoscope. This axle pack can be used with Image Rings or Image Disks. The axle can soldered or glued to just about anything. Comes complete with a 1/8"x 3" solid brass axle with threaded ends, a polished brass ball nut, and four wheel-mounting eyelets. The Image Disk creates a rotating image chamber for your kaleidoscope by joining two clear glass domes! The unique design lets in maximum light for an exceptionally brilliant image! The Image Disk copper-foils together in minutes and can be filled with scraps of glass, beads, jewels, or just about anything. 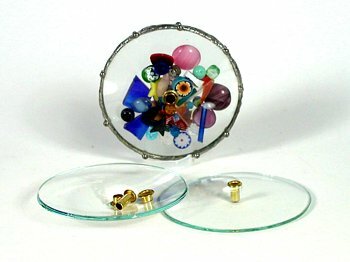 The package includes two 2½" diameter glass domes with center holes, mounting eyelets, and instructions. It mounts easily on the axle of Clarity’s Mini-Scope, Spiral-Scope, and Aeroscope, or can be mounted on your own kaleidoscope designs. 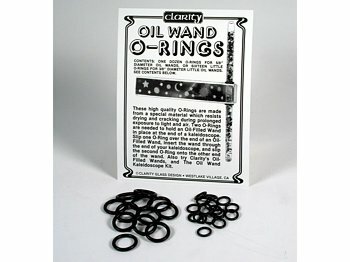 These durable black neoprene Oil Wand O-Rings are used to hold Clarity's Oil-Filled Wands in the end of a kaleidoscope. The O-Rings come in your choice of either Large or Small sizes. One packet contains either 12 large, or 18 small O-Rings. The large size fits Clarity's 11" Smooth or Spiral Oil wands or the Short Fat Wand. The small size fits Clarity's 6" Smooth or Spiral Little Oil Wands.